For Apple fans, iTunes is the home to where they get all of their music from in the first place. It’s a great place to make sure you can pick up top quality content and amazing songs at wonderful prices. However, it comes with one major problem if you change to a new computer. How can you transfer iTunes purchases to new computers. This is MUCH harder than it has to be. So, let’s take a look at how you can make that confusing process a little easier to understand generally. It works no matter your computers are signed in different Apple IDs or not. Apple makes it hard and even impossible to transfer iTunes purchases to new computer in different Apple ID as it expects you to pay more (which you can read over this help guide from the official Apple site). Luckily, there is alternative way that will help you to transfer iTunes purchase between different accounts without any hassle. 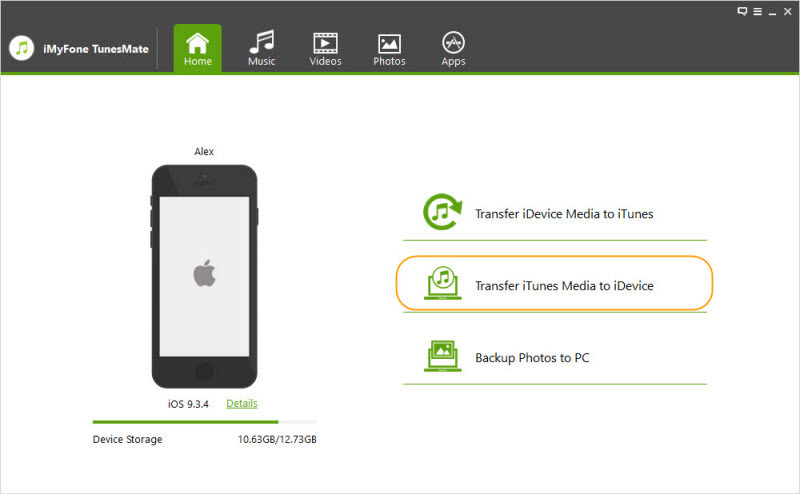 The one helps to transfer purchases is iMyFone TunesMate, an iPhone files manager. It’s two-way transfer makes it easy to transfer iTunes purchases from one computer to another, and makes it possible to share iTunes purchases with friends. Step 1. Start off by loading up iMyFone TunesMate on the computer where locates the iTunes purchases. Connect your iPhone or other iOS device. Note: All the iTunes purchases should be downloaded to your iTunes library. Step 2. Then, go to “Transfer iTunes Media to iDevice”. Then select the file type you want to transfer and let it transfer. The purchases will be transferred to your iPhone. Step 3. Unplug your iPhone and connect it to your new computer. Open TunesMate program on the new computer. Step 4. Click “Transfer iDevice Media to iTunes” and let it transfer all the media files from iPhone to the new iTunes library. Note: If you want to selectively transfer the purchases, you can go to “Music” or “Videos” tab and use the “Export > Export to iTunes” feature to transfer purchases. All your computers can be signed into different Apple IDs. Your computers can be in different places and in different network. You don’t need to have an external hard drive. An iPhone, iPad or iPod is ok.
You won’t run the risk of losing any data during the transferring process. It works only when your computers are in the same Apple ID. You can simply re-download the purchase onto a new computer. To do this, check out the official Apple page on how to access your ID and find downloads to reinstate. You could also use the Migration assistant, which you can find out more about here for both PC and Mac. You could also use the iTunes back-up system to deliver them to an external hard drive, if you so choose. To do this, you should use an external hard drive for help. For the detailed guide, you can refer to this guide. Lastly, you could use the Home Sharing feature which allows you to share and stream content on different media devices – up to five at once. However, this is limited to being on the same home network which means you cannot use this feature outside of your home, which is a bit of a nightmare. Now, you can use the feature. Be warned, though; it’s fairly limited in scope and will not be useful for those looking to carry out changes outside of the home network agreed upon.